They had two sons, Russell and Michael, and the family moved to Madisonville when the boys became school-age. She loved to sing and was a member of the Madisonville United Methodist Church Choir. In the late 1970’s, she moved to Bryan where she opened up “Specially For You”, a personalizing gift shop. She was a member of the Women’s Club of Bryan and FUMC of Bryan. 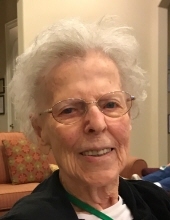 Upon retiring, she focused on the things she loved – traveling and spending time with her grandchildren and great-grandchildren. In her later years, she moved to the country to be closer to Russell and his family on his ranch. Madisonville Funeral Home in Madisonville, Texas is in charge of local arrangements. To send flowers or a remembrance gift to the family of Betty Woodburn White, please visit our Tribute Store. "Email Address" would like to share the life celebration of Betty Woodburn White. Click on the "link" to go to share a favorite memory or leave a condolence message for the family.